The trans-Tasman liner Wanganella, carrying 400 passengers from Sydney, struck Barrett Reef at the entrance to Wellington Harbour at 11.30 p.m. on 19 January 1947. Unlike the Wahine disaster, which happened in the same place 21 years later, the incident occurred in calm seas and everyone on board was safely evacuated. For 18 days the Wanganella was stuck fast to the reef, despite attempts by tugboats to tow it off. A remarkable spell of fine weather undoubtedly saved the ship from becoming a total wreck, leading to the local expression, ‘It’s a Wanganella day today’. Finally, on 6 February, the vessel floated clear on a southerly swell. The Wanganella was towed into Wellington and entered the floating dock. Repairs and industrial action delayed its return to service for almost two years. The 9576-ton Huddart Parker liner, launched in 1929, sailed between Australia and New Zealand from 1933 until 1962, apart from a period of service as an Australian hospital ship during the Second World War. From 1963 to 1970 the Wanganella was moored in Deep Cove, Doubtful Sound, as a hostel ship for nearly 300 workers building the Manapōuri tailrace tunnel and power station. In this role, the vessel became notorious for the drinking culture on board. When it was towed away to be scrapped in 1970, tugs apparently struggled to dislodge the ship from a bed of empty beer cans that had been tossed overboard. 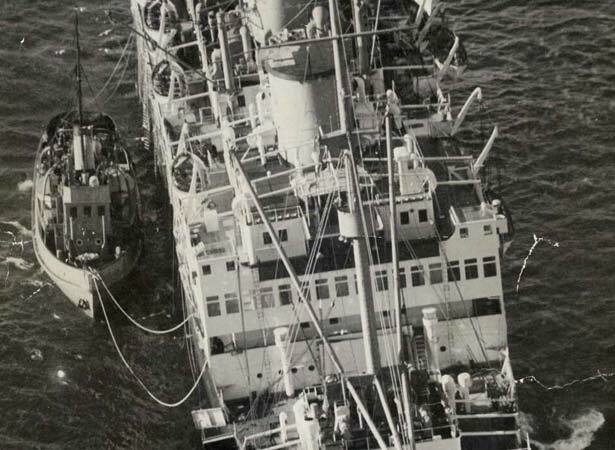 We have 1 biography, 8 articles, related to Liner Wanganella refloated in Wellington Harbour.